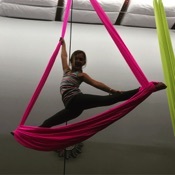 My 10 year old daughter had a great interest in learning about how to do circus aerials after seeing the Air Born Aerials perform at 4th Friday several times. After her first visit, she is ready for round 2! Clean space, online sign up for easy registration, thorough instructor and safety is #1. Looking forward to this being a 1x per week activity! I booked a private lesson and had the best time. I was so surprised I was able to do this! The instructor was great and made learning very easy. She covered alot and was very easy to work with. I cannot wait to come back! This is the best studio in all of Fayetteville! 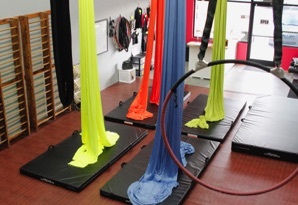 If you're looking to enhance your yoga routine or dare to reach new heights through aerial circus, this is the place for you! From beginners to patrons, all are welcome to this comfortable and motivating space. Before this, I only ever did yoga in my own home. 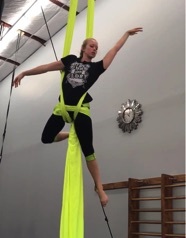 Now I am hooked and can't get off the silks! 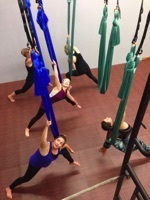 I just had my first private lesson with Crystal and I love aerial yoga already! It is challenging for sure but with Crystal's help I felt safe and comfortable. I cannot wait to go back and honestly would go every day if I could. Absolutely amazing! 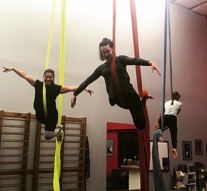 I decided to try Air Born Aerial out because I was starting to get bored with my usual gym routine and wanted something fun that I could learn. I had my first class last night taught by Zahra and it was fantastic! I was nervous but she was very welcoming and gave clear instructions so I was able to learn positions that I never thought were possible. I highly recommend! This place is amazing! The staff is just the right blend of easy going and firm for those who need a little more encouragement. The instructors have the knowledge and experience to make even the most hesitant student feel safe and comfortable. The facilities are clean and the equipment is high end.